My mom, Tilla Fields, was an amazing cook. In her early years, she served as camp cook on cattle branding outings in the northerly Great Basin Desert. Yep, with a horse-driven chuck wagon and dutch ovens dug into the ground and everything. With her skills, she could have become a professional chef, but was too modest to go for such a career. So her family reaped the benefits. My family didn’t typically buy fruit. We’d either grow it on our own bushes and trees, or trade with others, or best of all, we’d go wildcrafting. For weekend fun, my folks would bundle us all up in the truck with a picnic lunch, and we’d go out scouting how ripe the fruit on untended bushes in the region was getting. Wild cherries and plums are mostly pit, which means more work for less fruit, and blackberries have thorns and spiders to avoid while picking, but their strong tart flavors are unparalleled. We’d come home happy with full buckets and bellies, and the anticipation of both delicious treats now and jars full of goodness for the coming winter. Here is one of my favorite recipes passed down from my mom. She nearly always cooked from memory alone, but she wrote this one down upon my request. The beauty of it is its simplicity: it’s one of the few things she made that even I, her not very domestic daughter, can replicate. Enjoy! Melt butter in a 9×15 pan. Mix dry ingredients: flour, 1 cup sugar, baking powder, & salt. In a separate smaller bowl, mix wet ingredients: beat egg, add milk, oil, & vanilla. Then mix all together. Pour onto butter in pan. Don’t stir. Add the berries on top of the batter. Bake 30-40 minutes at 370 (high altitude). Serve with cream, if you like. Or ice cream. Or on its own. We who enjoy material prosperity in the modern day Industrial Growth Society are expected to chuck out imperfect possessions that we don’t use anymore and go buy new ones. However, I like to repair and repurpose things, so I’ve been doing some mending. Some of the clothes on the pile are nearly worn out. But that’s because they’re favorites and therefore too beloved to just let go softly into that dark night of the rubbish bin or consigned to a second life as cleaning rags without a fight. Others, I want to alter in some interesting way; to usher their good raw material into a new and more currently useable form. Even though I’m much more skilled at sewing the archaic way, with a simple needle and thread, I got our old sewing machine out for the first time in many years to make the work go faster. “Faster,” she said. Ha! As soon as I attempted to begin, the thread snarled up in incredible thick tangles over and over behind the bobbin. This being on the bottom side of the piece, I didn’t notice it until quite a few inches were already sewn and I was congratulating myself on the excellent choice to employ some metallic plug-in help. Then the snarl caught on the foot hardware and everything stopped cold. I turned the work over, and omg. In certain places, what was intended to be a neat row of small stitches was a mass two inches thick and a half-inch deep! What a mess. I tried a few more times, with no luck. As a last desperate resort, I finally broke down and got out the owner’s manual to try and understand what was happening. Not surprisingly, this helped. Improper settings for the kind of material, thread, stitching style, etc., had indeed caused part of the problem. But really, getting deeper to the core of the issue, machines have never liked me. You’d think they would cut me some slack due to my family: my dad, a mechanic, served their kind his entire life. He worked on aircraft, cars, motorcycles, and small stroke engines like chainsaws and outboard motors. He even single-handedly rebuilt three-and-a-half P-51 warbird airplanes from the WWII era, one from a husk found abandoned out in the desert. 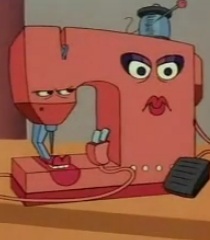 And my mom cared for this exact same sewing machine for decades. Where’s the gratitude? But machines don’t seem to think that way. It’s all about their needs and their individual relationships with us soft-bodied creatures, and something about me is apparently just too much water to their oil. Thinking about it, maybe it’s because I’ve not given this one a name, nor painted Celtic knotwork all over it, or suchlike. I seem to get along better with the machines that I anthropomorphically spoil, or at least art up. Or perhaps it balked because I don’t use it enough, and it feels under-appreciated; without a strong purpose. Hm. You reading this: how do YOU personally develop a mutually happy relationship with the machines in your life? Inquiring, frustrated minds want to know. For myself, I think I am better off sticking mainly to simpler tools like the hand needle, thimble and thread. Even with it occasionally drawing blood and me taking a lot longer to complete tasks, there’s less wariness between us. We know what to expect from one another. We can get along.